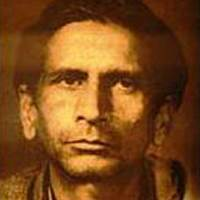 Asrar ul Haq Majaz was a distinguished and one of the most progressive Urdu shayar and journalist famous for romantic and revolutionary poetry. He was the maternal uncle of film lyricist Javed Akhtar. His father's name was Sirajul Haq. Majaz did his graduation from Aligarh Muslim University, where he started his career as a poet. Majaz began his career as the first editor of the Urdu journal of All India Radio, Aawaz – Delhi. However, he soon left the job to become an active member of the Progressive Writers Movement. In collaboration, with Sardar Jaffri and Sibtey Hasan, he started the most influential progressive literary monthly magazine of that period, from Lucknow. This magazine was known as Naya Adab. His collections of poems are under two titles, 'Ahang' and 'Shab Tab'. His most famous poem is 'Aawara'. It is a personification of the yearning of a modern young man of a big city, where money is the only commodity that can buy happiness. His other poems like Nora and Nazr-e-Aligarh were also very famous during that era. At one point of time he was undergoing treatment for addiction to alcohol at Ranchi Mental Hospital. He died in Lucknow in 1955.